"There is more treasure in books than in all the pirates' loot on Treasure Island." With its use of repetition and colorful illustrations, this book is a great choice for a first grade teacher to use within her classroom. I actually used this book during my time as a tutor for a first grade ESL student and she had great success with reading this book aloud. While she did struggle with some of the more difficult words (like purple for example), the use of repetition within the text helped her to become very familiar with the words and the more I had her read it to me the more fluent and confident she became with her reading ability. 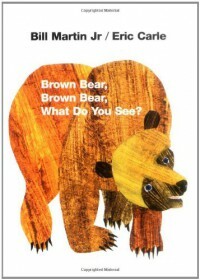 If I were to implement this in my first grade classroom, I would have students complete their own version of "Brown Bear, Brown Bear What Do You See?" using a paper fill-in book. After reading the book together as a class, each student would get their own paper fill-in book and would get to fill in the blanks on each page with their own colorful animal they would like to incorporate into the book. Students would also get to draw and color the animal they have written into the book. 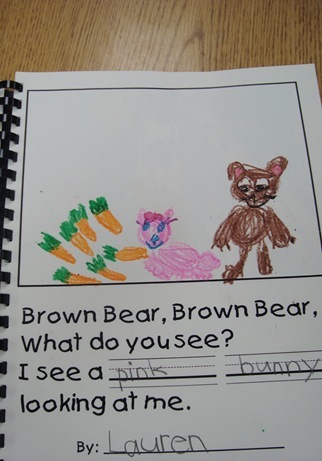 This activity gives students the freedom to choose what they want to see in the book and allows them to practice writing different animal names and colors.